COOPWORTH 6 - color BATTING, 2 oz. $8.50. ﻿ Roving is processed fiber - it has been scoured (washed), combed & carded and put through a machine that shapes it. This is great for hand spinners, weavers, needle felters, wet felters and the list continues.........use your imagination! Coopworth/Natural Dk. "Blue" or Medium Brown, 2017. Jacob (blend of fleeces), 2017. Above is what I have in natural colors. The price is $38/lb. or $10.50/4 oz. or $3.00/ounce + shipping. Coopworth 2 - Way Swirl, White w/Aztec Gold dye, 2016/back from a shop! SOLD OUT, THANKS FRAN! Coopworth 2 - Way Swirl, White w/Spruce dye, 2015/back from shop! Coopworth 2 - Way Swirl, natural Dk. "Blue"w/Cherry Red over-dye, 2017. LOW, THANK YOU FALL FIBER FESTIVALS! Coopworth 2 - Way Swirl, White w/Natural Lt. "Blue" over-dyed Sky Blue. 2017. SOLD OUT AT MONTPELIER, THANK YOU! Coopworth natural lt. "blue"(silver) w/Burgundy over-dye, 2016. (almost gone! )/back from shop! Coopworth 2 - Way Swirl, Lt. "Blue"(Silver) w/Aztec Gold over-dye, 2017. SOLD WELL AT RHINEBECK, THANK YOU! Coopworth 2 - Way Swirl, natural black w/ white w/Bronze Green dye, 2017. ALMOST GONE! Coopworth 2 - Way Swirl, White w/Burgundy dye, 2016. ALMOST GONE! Coopworth 2 - Way Swirl, White w/Lilac dye, 2017. Coopworth 2 - Way Swirl, Lt. "Blue" w/Teal over-dye, 2017. SOLD OUT! Coopworth 2 - Way Swirl, White w/violet dye, 2016. Coopworth 2 - Way Swirl, Lt. Blue w/over-dye Crimson, 2017. Above are Coopworth 2 - Way Swirls (w/dyes & over-dyes. Price: $45/lb. or $12.25/4 oz. or $3.50/oz. ​You are only limited by your creativity & imagination when it comes to spinning! Just review the natural colors, the 2 - Way Swirls and the new 3 - Way Swirl that is below and let your ordering begin - I take orders via email, phone or on the "Store" on this website. The shipping is not set-up on the store, that is billed to you after your order is boxed and ready to be mailed! Roving is a great gift! 2 - Way Swirl: Alpaca, natural white & Coopworth, natural black. 2017. SOLD OUT AT RHINEBECK! 2 - Way Swirl: Alpaca, natural lt. fawn & Coopworth, natural white/2017. GETTING LOW! 2 - Way Swirl: Alpaca, natural dk. fawn & Coopworth natural white/2017. 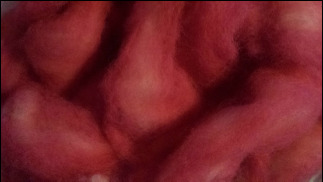 Above are 2 - Way Swirls with natural alpaca: $51/lb. or $13.75/4 oz. or $3.75/oz. 2 - Way Swirl w/lt. blue COOPWORTH (50% over-dyed teal, 50% over-dyed sky blue), 2018. HALF GONE! 2 - Way Swirl, w/dk. blue COOPWORTH (50% over-dyed burnt orange, 50% over-dyed golden yellow), 2018. Getting low! 2 - Way Swirl dk. blue COOPWORTH (50% over-dyed hot fuchsia, 50% over-dyed burgundy), 2018. ALMOST GONE! ​Fiber from Hearts of the Meadow Farm almost spins itself - the staple length of COOPWORTH is 6 - 8 inches, an excellent fiber for "beginner spinner's"! It also is excellent for needle felting and wet felts in about 15 minutes! My COOPWORTH wear coats most of the year to offer you a fleece w/very little VM and roving w/o VM, easy spinning! My JACOB is softer than normal, the sheep wear coats most of the year to prevent VM and burrs in the fiber - it offers a much cleaner raw fleece and less work for me with skirting! 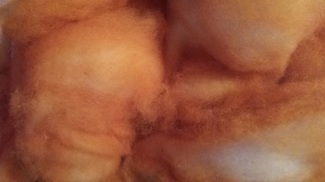 The end result is a softer fiber w/o VM at all! The alpaca offers an added touch of softness when combined with either COOPWORTH or JACOB. It gives the spinner the feel of alpaca but keeps the price a bit less then total alpaca. The over- dyes are awesome in color each year! 2 - Way Swirl: Alpaca, natural black w/Jacob blend, over-dyed Vermillion, 2018. 2 - Way Swirl: Alpaca, white/dyed periwinkle blue w/natural black COOPWORTH, 2018. MAYBE 1/3 LEFT, THANK YOU RHINEBECK! 2 - Way Swirl: Alpaca, natural red-brown or dk. fawn w/Coopworth white, dyed Teal, 2017. ALMOST GONE! 2 - Way Swirl: Alpaca, natural slate/dk. grey w/white COOPWORTH, dyed aztec gold, 2018. 2 - Way Swirl: Alpaca, natural black w/Jacob blend, over-dyed Turquoise, 2018. 2 - Way Swirl: Alpaca, natural slate/dk. grey w/white COOPWORTH, dyed pumpkin orange, 2018. ALMOST GONE! 2 - Way Swirl: Alpaca, natural red-brown w/dk. blue COOPWORTH, over-dyed spruce, 2018. 2 - Way Swirl: Alpaca, natural white w/white COOPWORTH, dyed burgundy, 2018. Above are 2 - Way Swirls w/alpaca & wool (50/50) w/dye: $58.00/lb. or $15.50/4 oz. or $4.50/oz. Below is a 3 - Way Swirl/ COOPWORTH: white dyed in 3 swirls: teal, olive & gold ochre, 2018. 3 - Way Swirl, 2018. $64/lb. or $17.50/4 oz. or $4.75/oz. SOLD OUT AT THE FIBER RETREAT/TN - THANK YOU, ENJOY! This is a 2018 2 - Way Swirl w/50% natural LLAMA and 50% COOPWORTH, white dyed CRIMSON. Price: $60/lb. or $16/4 oz. or $4.75/oz. This is a 2018 LLAMA 2 - Way Swirl, it is with white COOPWORTH, dyed VIOLETt. ​Price: $60/lb. or $16/4 oz. or $4.75/oz. Coopworth or Jacob (all natural, w/o dye) - $38/lb. (one pound or more), $10.50/4 oz., $3.00/oz. Coopworth 2-Way Swirl (w/1 dye, also "over-dyes") - $45/lb. (one pound or more), $12.25/4 oz., $3.50/oz. Alpaca/Coopworth 2-Way Swirl (50%/50%, w/o dye) - $51/lb. (one pound or more), $13.75/4 oz., $3.75/ oz. Coopworth 2 - Way Swirl (both swirls over-dyed) - $54/lb. (one lb. or more), $14.00/4 oz., $4.25/oz. Alpaca/Wool 2 -Way Swirl (50%/50% w/1 dye) - $58/lb. (one lb. or more)​, $15.50/4 oz., $4.50/oz. 3 - Way Swirl (COOPWORTH w/3 dyes: teal, olive & gold ochre) - $64/lb. (one lb. or more), $17. 50/4 oz., $4.75/oz. This was SOLD OUT at the Fiber Retreat at Roan Mountain, Tennessee! Llama (natural, w/1 dyed wool) - $60/lb. (one lb. or more), $16/4 oz., $4.75/oz. CALL OR EMAIL IF YOU HAVE ANY QUESTIONS, REMEMBER THAT I DO ACCEPT CREDIT, PAYPAL OR CASH. YOUR SHIPPING NEEDS TO BE ADDED TO THE COST AFTER YOUR ORDER IS PACKAGED AND WEIGHED, THANK YOU! NOW, PLACE AN ORDER & SPIN! When a 2-Way Swirl is spun, a "tweed" effect is the result! You, the spinner have several options: you may spin another bobbin of the same and when plyed get a total "tweed" yarn. You may also ply with a bobbin of white to soften the color or ply it with a darker color to tone it down. Just think of all that you will be able to do if you ply a 3-ply yarn! Now...let's really be creative and just think about the new 3 - Way Swirl!